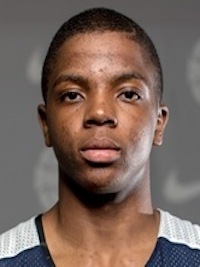 Two days ago, ’16 Lima Senior PG Xavier Simpson announced that he would be making a verbal commitment to one of his four finalists – Illinois, Wisconsin, Iowa State or Miami (FL) – on Wednesday at a press conference at his school. Heading into Wednesday morning everything seemed status quo with the Simpson recruitment. Some were speculating that he would end up at Illinois, others that the choice would be Wisconsin. With Miami (FL) never receiving an official visit from Simpson, and Iowa State having received a point guard commitment since the Lima guard’s official visit last month, those two schools seemed to be long shots. So it was Illinois or Wisconsin right? Wrong. On Wednesday afternoon at Lima Senior High School, Ohio’s top ranked point guard from a loaded 2016 class shocked the community by committing to the University of Michigan. As the word spread more information became available, such as the fact that Simpson’s family snuck in a quiet visit to Michigan’s campus in Ann Arbor on their return home from their official visit to Wisconsin last weekend, and the pieces to the puzzle seemed to fall into place more clearly. In this writer’s opinion, Michigan’s style of play actually fits Simpson better than any of his other choices, while Ann Arbor also allows him to play his home games within two hours of his Lima home. Add in the fact that Wolverines head coach John Beilein has built a reputation for producing a consistent upper-Big Ten team and often a National Championship contender, and you’ve got the perfect storm for Simpson. With current Michigan guards Spike Albrecht entering his senior year and Derrick Walton Jr entering his junior season, Simpson should have an opportunity to see the floor right away at Michigan, where the point guard’s floor vision, leadership and defense should allow him to become a solid Big Ten player sooner rather than later. The addition of Simpson to Michigan’s now four-man recruiting class gives the Wolverines a dynamic foursome of talent, and coincidentally one that includes three Ohio natives. Simpson joins Pickerington Central wing Ibi Watson and Medina post Jon Teske in UM’s 2016 recruiting class, while massive Michigan born post Austin Davis rounds out a group that Beilein and his staff have to be excited about. Adding Simpson, a consensus top ten point guard nationally in the class, not only keeps Beilein’s strong Ohio ties running, but it gives him a viable option to replace Albrecht and Walton, both of whom played more than thirty-two minutes per game last season. Simpson coming off of the board means that yet another Ohio prospect from 2016 has committed to a high-major program, as one of the best classes to come through the Buckeye State in recent years continues to earn more accolades. With the top point guard now moved into the committed category, Garfield Heights now boasts the state’s top two available senior prospects in wing Frankie Hughes and forward Willie Jackson.